It’s always a little strange when new CG trailers get churned out for a game that we’ve already seen proper in-game footage of. 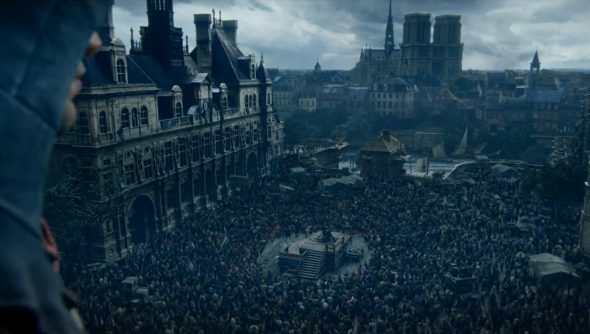 Mind you, the latest CG trailer for Assassin’s Creed Unity is a smart one, with lots of flash and acrobatic shenanigans. It also introduces a woman, in case you were wondering is Unity would have any of them. Yep, there’s one. She needs to be rescued first, though. Ah. The woman in question is Elise, a noblewoman and a Templar. So not the sort of person you’d normally expect an Assassin to risk life and limb to rescue. Being a Templar, there’s a good chance she’s handy in a scrap, and the end of the trailer suggests that she knows how to use a sword at the very least. There’s not much beyond the vague introduction to Elise, other than the eye candy of Paris, which we’ve already seen quite a lot. The tune’s not bad though.